There are multiple ways to allocate costs – automatically, directly at the MFD, or using client software on laptops and desktops. If you are using Web Print, our print solution without drivers, click here to find more information about Shared Account Web Print. An admin can automatically allocate print jobs to a department, client, or cost centre for individual users. Click here for more information on how to set this up. PaperCut MF users can select which shared account to charge to – right at the MFD, and at the time of job release. This gives them the choice to print from their computer using the user client, or from their personal device without needing to install the Client Tool. This is a great option for organizations using Mobility Print or any of our other mobile or BYOD printing solutions because it means no extra steps - just allocate an account and collect your print jobs all at once. Standard - A simple solution for organizations with a few accounts or less complex cost allocation requirements . Advanced - An advanced solution for users with many accounts – or more complex cost allocation needs – with features such as search, preference lists, recent selections, cost adjustments, comment entry and invoicing options. This is ideal for businesses, including engineering, legal, accounting and architecture firms. Note: Both of these options require the PaperCut Client Tool to be installed on a user's computer. 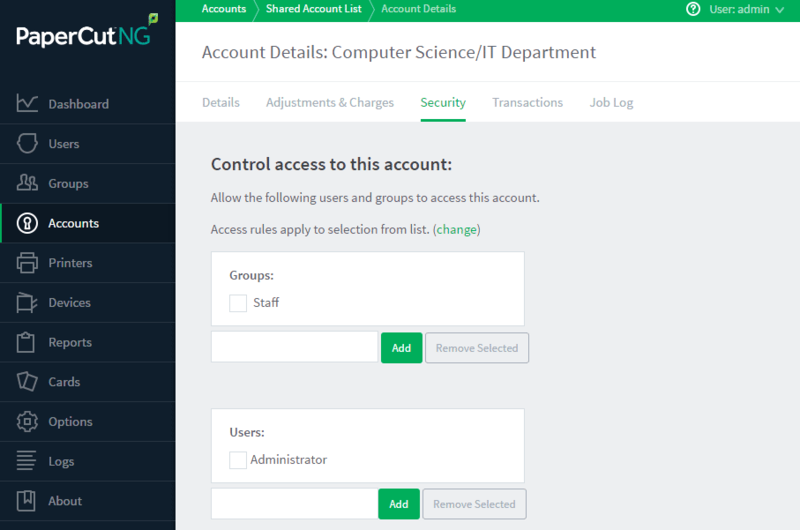 Access to accounts is controlled via integrated network group membership or optionally PINs.